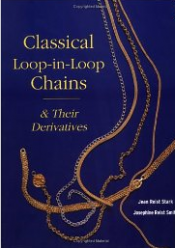 Classical Loop in Loop Chains is an amazing book and one of the first I was introduced to as a budding metalsmith. The basic concept here in making loop in loop chains is that a series of small loops of wire are made and then fused closed. Each new link is then inserted into the previous link. Repeating this pattern of inserting links over and over again is what causes the chain to grow. 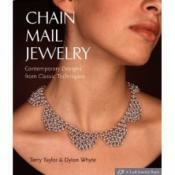 This book start out with a section called, Chain Mail Basics, and presents the fine craft of chain mail from a historic perspective. Originally thought to originate in the 5th century, chain mail is recognized by most of us as having been used as a protective shield for knights during the days of the Crusades.